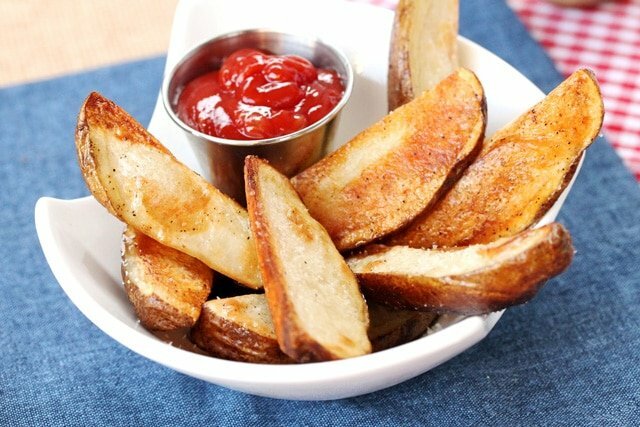 These steak fries with homemade smoky ketchup make a delicious addition to a meal and are wonderful any night of the week. 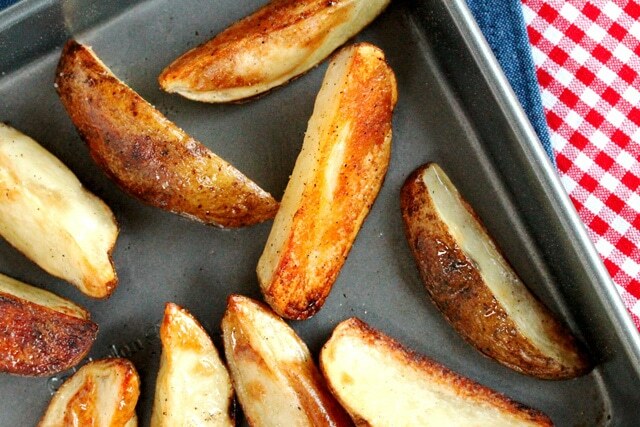 Potatoes are such a loyal refrigerator pantry item. 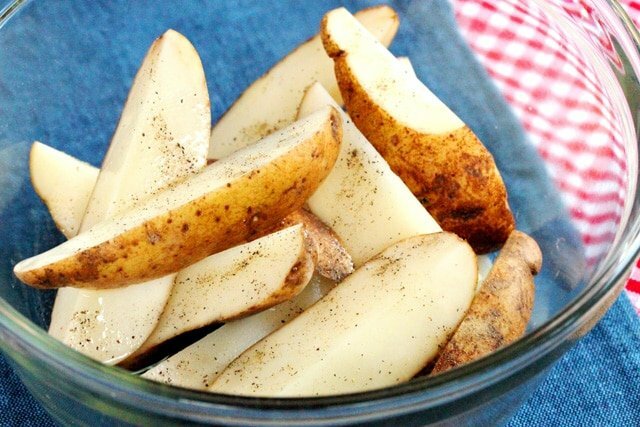 They last nicely in their veggie drawer and are there for you when you need them for a quick and easy side dish like these steak fries. When shopping for potatoes it’s amazing how much cheaper the bags of potatoes can be compared to buying them separately by the pound. Unless of course the separate per-pound price of potatoes is on a super great sale. The only thing about buying them in a bag is they don’t always have large baking size potatoes in them. 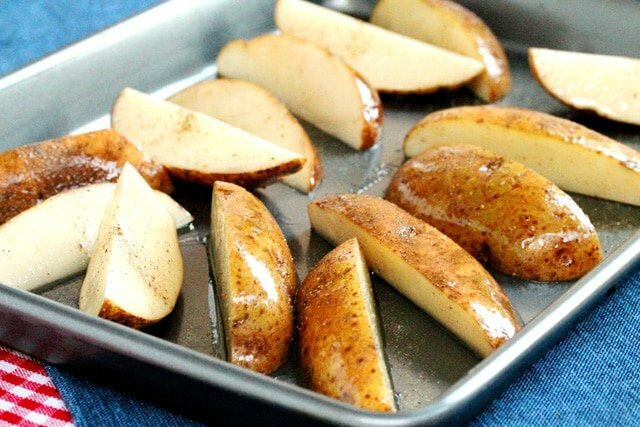 About the only time I’ll fork over the extra money to buy the potatoes separately is when I need the large baking size for a particular recipe like for this “Salt-Crusted Baked Potato with Hamburger Gravy“. Recently I bought a 5 pound bag of potatoes because they were on such a great sale. But my fridge happened to be packed so I had to temporarily store them in my cupboard. I was surprised at how fast those little roots grew on the potatoes by being stored in the cupboard instead of the fridge. Once I noticed those little roots growing I just broke them off and into the fridge veggie drawer they went. 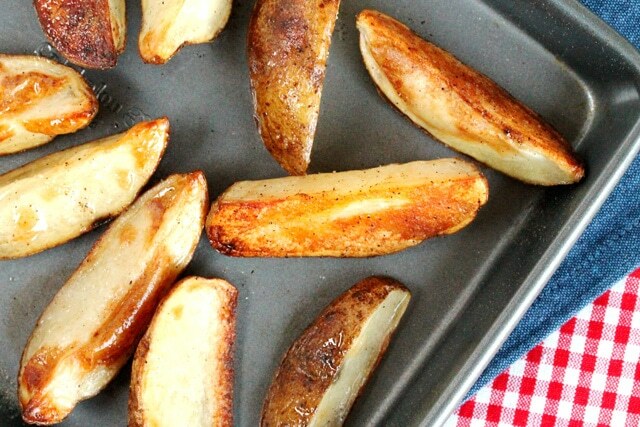 These steak fries are so simple to make, require just a few ingredients, and taste wonderful. And the good news is that they’re oven roasted and not fried. 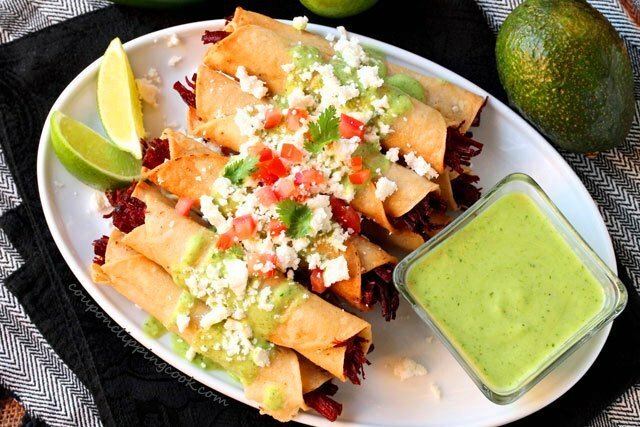 They’re especially scrumptious when served with smokey ketchup which is made with just a dab of Liquid Smoke. If you’ve never used Liquid Smoke I have to tell you that just a dab will do you; a little REALLY goes a long way. A long time ago one of my friends said to try a little Liquid Smoke in my spaghetti sauce. Well now I know that “a little” is a relative term because I used too much and the sauce was so horrible I can’t even describe it. But, when used sparingly it adds such a nice flavor. 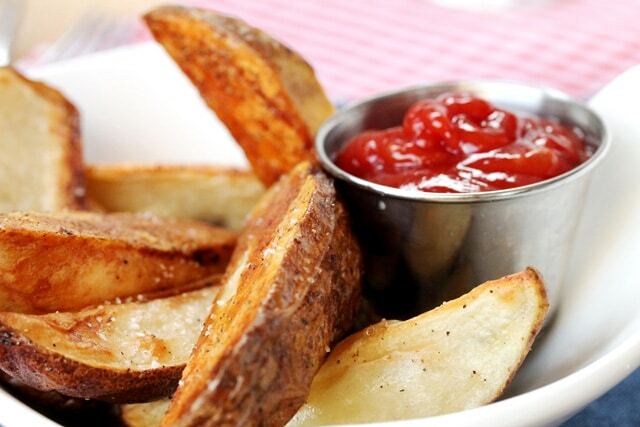 *Kosher salt has larger crystals than regular salt which gives these steak fries a nice burst of flavor. But if you don’t have Kosher salt, feel free to use regular salt. Rinse off the potatoes and pat them dry. Leave the skin on but cut off any imperfections or bruises. 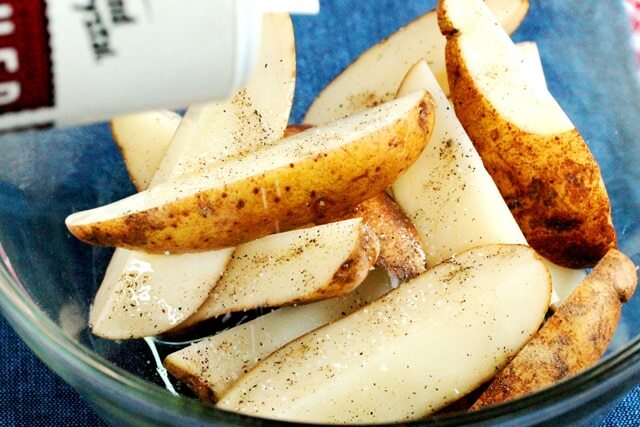 Cut the potatoes in quarters lengthwise. 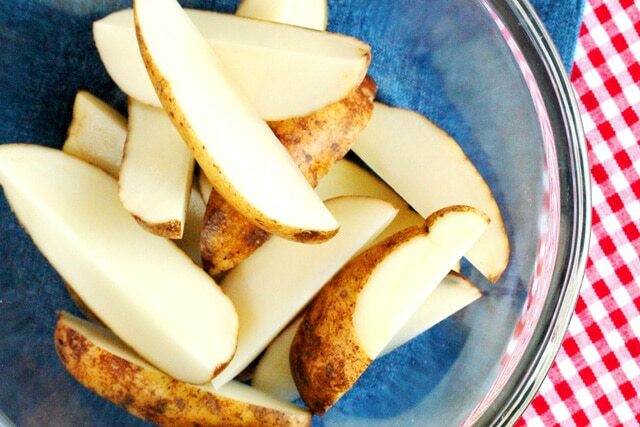 If the potatoes are more on the round side you may need to cut them in fifths or sixths. and salt. Mix together so all of the potatoes are coated in the oil mixture. 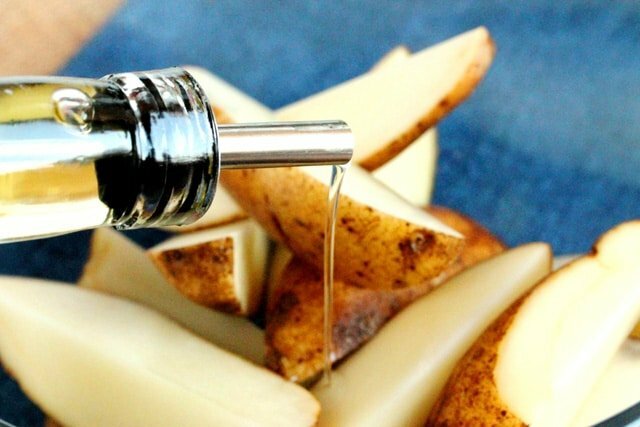 Drizzle olive oil on a cookie sheet (or use cooking spray if preferred). Then add the potatoes to the cookie sheet cut-side down. Spread the potatoes out so that they’re not laying on top of one another. Roast in the oven until the sides facing down turn a golden color (about 25 minutes). When they come out of the oven salt to taste. Make this while the potatoes are cooking. 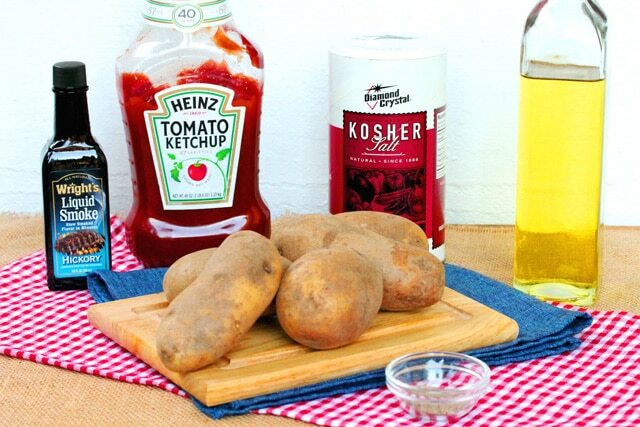 While the potatoes are cooking, add ketchup to a small bowl. Then add the Liquid Smoke. Stir the ketchup mixture. Give it a taste test and if more smokey flavor is preferred, add a tiny bit of the Liquid Smoke at a time in between taste tests. 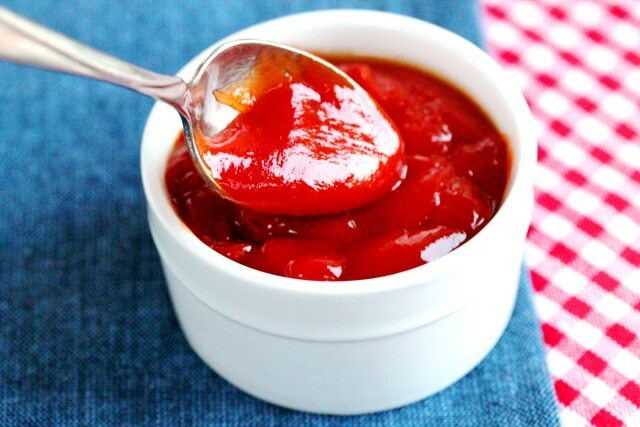 TIP – When making the Smoky Ketchup – be careful when adding additional Liquid Smoke to the ketchup. Only add it in tiny amounts because it’s extremely strong and can easily overpower the taste of the ketchup. If there was such a thing as an eye dropper size measuring spoon, that’s what I would classify as “tiny”….just one drop at a time. 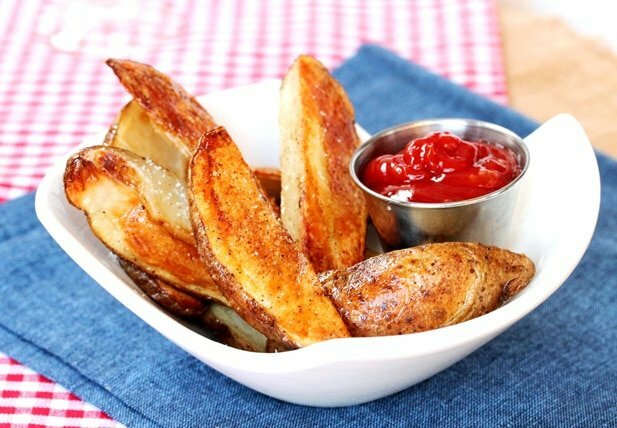 These steak fries with homemade smoky ketchup make a delicious addition to a meal and are wonderful any night of the week! 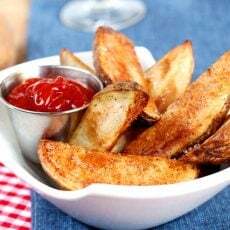 *Kosher salt has larger crystals than regular salt which gives these steak fries a nice burst of flavor. But if you don't have Kosher salt, feel free to use regular salt. Rinse off the potatoes and pat them dry. Leave the skin on but cut off any imperfections or bruises. 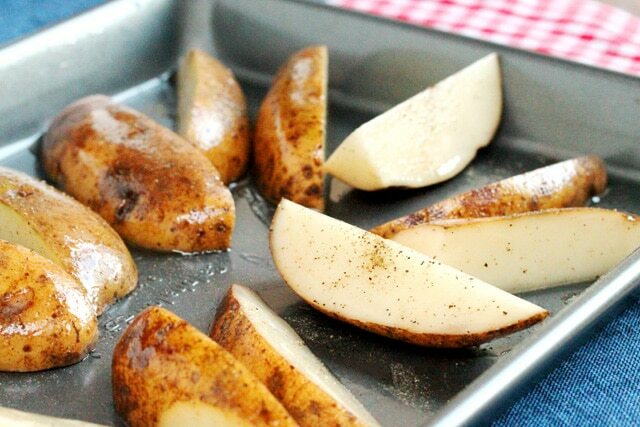 Cut the potatoes in quarters lengthwise. 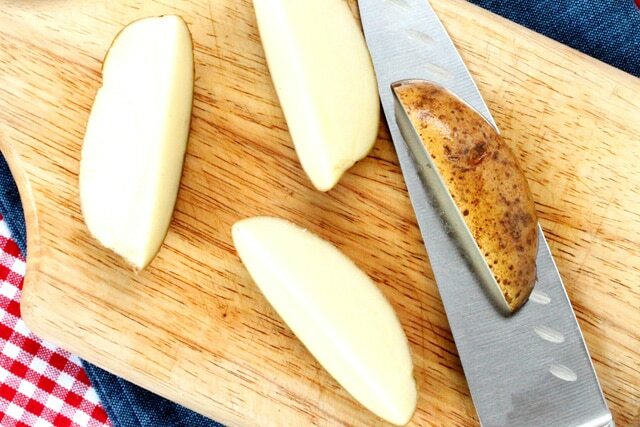 If the potatoes are more on the round side you may need to cut them in fifths or sixths. In a medium size bowl add the potatoes, olive oil, pepper, and salt. Mix together so all of the potatoes are coated in the oil. On a cookie sheet pan (with sides), drizzle olive oil (or spray with cooking spray if preferred). To the pan, add the potatoes cut side-down. Spread the potatoes out on the pan so they aren't touching one another. Bake in a preheated oven until the sides facing down turn a golden color (about 25 minutes). To a small bowl, add ketchup and Liquid Smoke. Stir. Do a taste test, if more smoke flavor is preferred, add just a tiny bit more of the Liquid Smoke at a time in between taste tests. Be careful when adding additional Liquid Smoke to the ketchup. 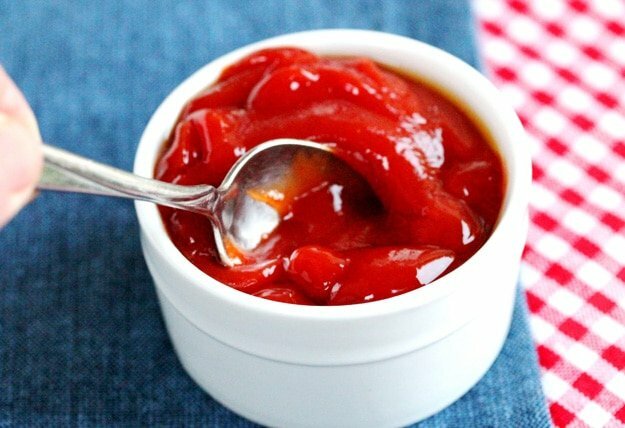 Only add it in very small amounts because it's extremely strong and can easily overpower the taste of the ketchup. 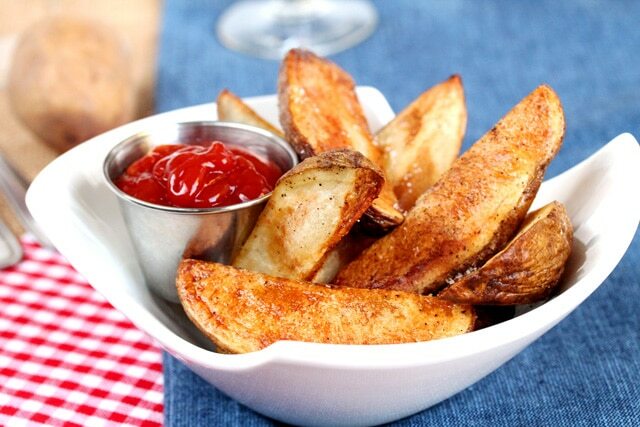 Serve the steak fries hot right out of the oven along with the smoky ketchup. 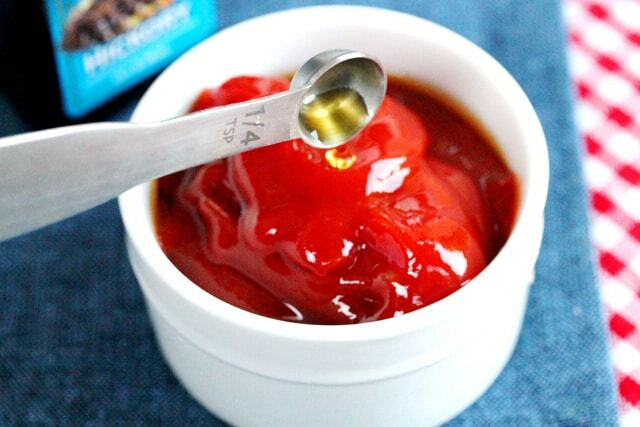 When making the Smokey Ketchup - be careful when adding additional Liquid Smoke to the ketchup. Only add it in very small amounts because it's extremely strong and can easily overpower the taste of the ketchup. 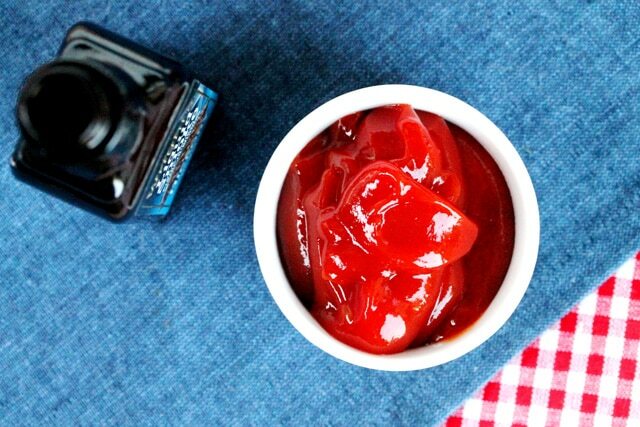 That Smoky Ketchup, is the complete bomb! I used to love my fries with a little shake of Smoke Salt but you can’t find that stuff anywhere now! At least, I don’t know where to buy it. The ketchup, adding the liquid smoke, is a nifty idea! Hi Judy, so glad that you like it. The liquid smoke does a great job of flavoring the ketchup. Have a nice weekend! Will never make anyother way! I did one cookie sheet non greased (even though they had adequate Olive oil) and they stuck to the pan. The pan I did extra spray of “PAM” slid right off . The ketchup flavor was sooooo summer!!!!! Thanks! Hi Jules, sorry that the potatoes didn’t work out the first time. I’ve noticed that sometimes depending on the pan I use with other recipes I’ll have this come up too. Just to be on the safe side I updated the recipe to drizzle some more olive oil on the cookie sheet or spray some Pam. So glad that they worked with the extra spray of PAM. Thank you for letting me know how these turned out. 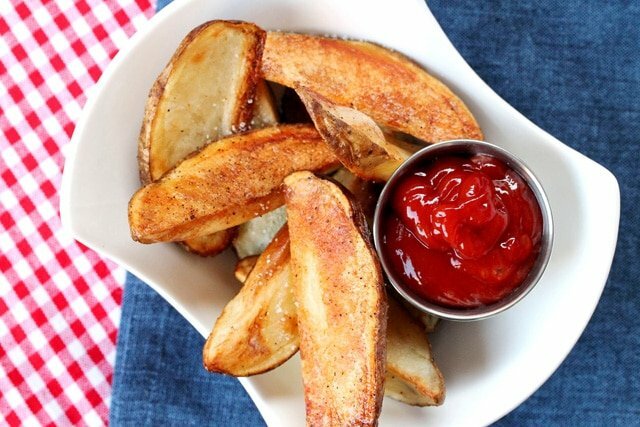 These Fries and Ketchup look WONDERFUL! Looking forward to trying your recipe! Hi Lorie, thank you very much. Have a great day! I prefer baked potato fries to fried. But I never thought of dressing up the ketchup. Great idea. And that liquid smoke goes a long way. The bottle can last me for years. Thanks for sharing. Hi Linda, thank you so much for stopping by and have a great week too!